As we sit back and watch the news about those terrible drug wars in Mexico and South America. The rhythm of our daily life in the West revolves around us taking mind-altering psychoactives to wake us up, keep us going or slow us down. Things to make us feel more sociable, more confident, stronger, less lonely, less of a failure…more of some things and less of others. It seems that everybody takes drugs in some form, at some time, across the globe. The aim of this project is to look at how drugs and humans became so intertwined, and through this understanding, offer some views on how this relationship could look in the future. When did we start taking drugs? Does everybody use some sort of drug? Why are some drugs legal and others not? These are some of the questions that prompted this research. We focus on alcohol and cocaine. Both have a long history in different contexts. Both bring immense pleasure and cause great harm. Both bring people together and bring out our social best. Or our worst. But one stimulates us, the other slows us down, and one is legal, the other prohibited. We decided to look back as far as the human evolutionary story could take us. This is the perspective of macrohistory, an interdisciplinary, big picture view. It’s a view that allows us to look not only at the important events that occurred on our journey with psychoactive drugs, but the forces that shaped these events and the trends that emerge over the course of human history. Of course, standing back to view the big picture will always necessitate the sacrificing of some detail. But this is where we can zoom in on particular moments in time to more thoroughly examine what is going on. And then zoom out again. Our interpretation of these trends is that although the use of drugs is ubiquitous and constant throughout human history, what does change is society’s perceptions of them. These perceptions then influence regulation and social behaviour, which mirror the action of a pendulum, swinging from one extreme to another, but always trying to find its way to the centre of the arc, to rest, albeit precariously, in the place of moderation. The pendulum swings between the extremes of perception: drugs are good – drugs are bad. Our pendulum has two dynamics. It travels from one end of an arc to another, but also moves in a circular horizontal movement. This is the circle of the interplay between alcohol and cocaine, and could also include many other drug names along the circumference points. 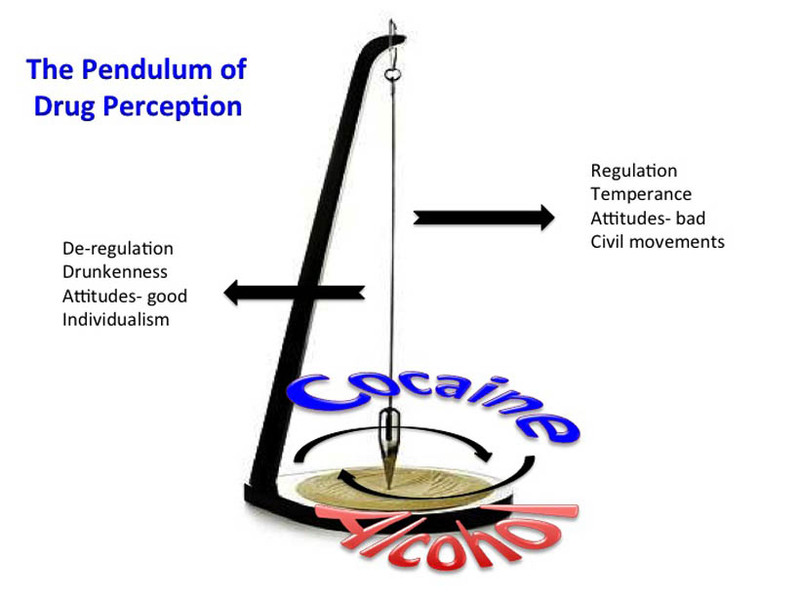 This dynamic symbolises the fact that all drugs are inter-related and a shift in perception of one drug will affect the use and patterns of another. And our journey doesn’t end at the present time. We envisage four future scenarios where we transpose those trends and driving forces of our relationship with drugs, into four very different worlds. These scenarios are not intended as a prediction for the future. Rather, they serve as a vehicle to spark thought and discussion of how things might play out given the set of real constraints that are known to act in a world where drugs and humans are inextricably intertwined. It may give us more insight into aspects of the here and now, and help us to recognise the forces that mould our future as they appear.